L'Histoire de l'enfant prodigue, Jean I Leblond, French, ca. 1636, Paris. Etching; sheet, 10 1/4” x 12 15/16”, prints. Photo courtesy of the Metropolitan Museum of Art. Perhaps one of the most recognizable stories in the Gospel is that of the Parable of the Prodigal Son. It tells of two sons, one of which asks for his inheritance and leaves his family to live a life of immoral frivolity. He returns later on as a penniless vagrant, sorrowful and ready to appeal to his father for mercy, but his father welcomes him with joy, shockingly without criticism, even ordering a party to be thrown in celebration of his son’s return. The elder son is enraged. 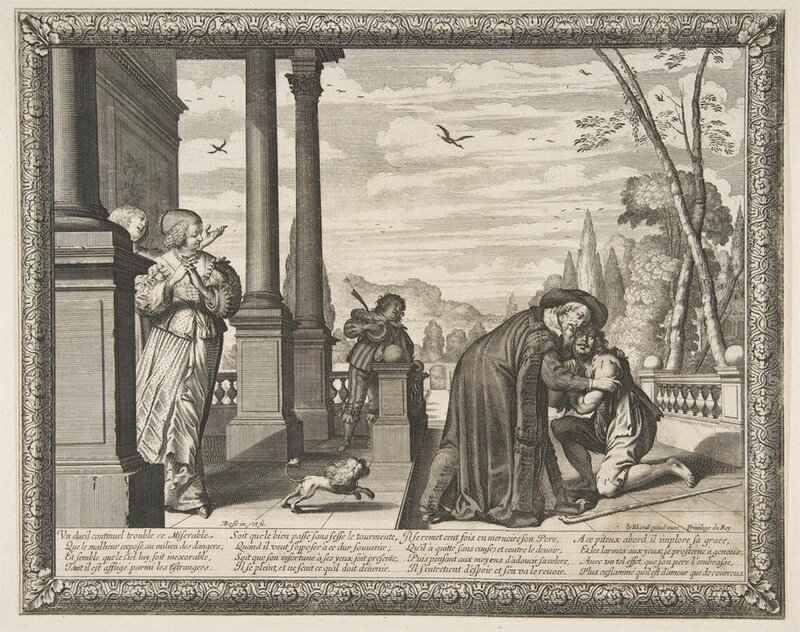 At the parable’s end, the father is pleading with his firstborn to come inside and share in his forgiveness of the prodigal, or “recklessly extravagant,” son. Where it’s left, we don’t know if he does, just that the offer is there. Upon reading Timothy Keller’s The Prodigal God: Recovering the Heart of the Christian Faith, I realized an incredibly difficult truth about myself: that while I’ve tried my hand a few times at being the younger brother, I’ve lived the majority of my life as the elder brother: dutiful, reverent, and obeying of the rules, but self-righteous in my piety—when it matters most to come inside for warmth, my pride often leaves me in the cold. Keller writes that the two brothers in this parable represent “the two basic ways people try to find happiness and fulfillment: the way of moral conformity and the way of self-discovery.” These different paths to happiness are often integral to our character development—the way we think, act, and feel. If you defer to the way of moral conformity, you align most with the character of the elder brother. If you lean toward the path of self-discovery, you align most with the younger. Not everyone falls neatly into one of the two, but some often experiment with both over the course of their life: either trying their luck at conforming to the rules of faith or society then, upon finding it suppressive, flipping their outlook, or the reverse. I’ve done both. In the telling of this parable, Luke 15:1-3 portrays Jesus speaking to the Pharisees, who were criticizing Him for befriending sinners. Just before telling them the Parable of the Prodigal Son, Jesus tells them two other seemingly similar parables: the Parable of the Lost Sheep and the Parable of the Lost Coin. Both describe an individual losing something before going to seek it out. Keller highlights that by the time Jesus tells the Pharisees the third story, the Parable of the Prodigal Son, they would’ve presumed that, again, an individual was to lose something before seeking it out. But while the elder brother and doting father lose the beloved younger son in this third parable, no one leaves to look for him. No person sets out to bring him home. Just as God instructed Cain, an elder brother, to care for and protect his younger brother, Abel, the end result was no different: the elder did not care for the younger, not enough to save him from himself. Yet he needed to be saved all the same. Each of us know someone who resembles the younger brother in Jesus’ parable, if we aren’t this character ourselves: independent, selfish, indulgent, thoughtless, and operating out of fleeting whims driven by pride or greed. He is wealthy, free, and has every comfort and opportunity at his fingertips. Still, the younger brother is desirous of greater freedom and flees from his father’s watchful eye in order to do as he pleases, take control of his own fate, and act out his desires with abandon. He doesn’t want to conform. He doesn’t want to follow the rules. He doesn’t want to be told he’s wrong, despite knowing it at his core. And the consequences are ruinous. He squanders away his vast inheritance, sullies his good name, and lands among the pigs, literally. In contrast, the elder brother does everything right, is nearly faultless in character and deeds. He is disciplined, dependable, pious and good-natured. He helps maintain his father’s property, and he is respected among the household, with a calm, even temper. Until his younger brother returns home, at which point he is furious. Suddenly, he exhibits bitterness and ill-will and refuses to come in to the feast his father throws in celebration. Keller notes this striking role reversal: the “bad” brother is lavished with a party and the “good” brother stands out in the cold, determined not to partake in the festivities. He felt he’d earned what he was given, and that his younger brother was undeserving of grace, and it infuriated him. Keller writes that Jesus meant for this parable to show us a deeper understanding of sin: that whether we break all the moral rules, like the younger brother, or we keep them fastidiously, subconsciously tallying all our good deeds for God, like the elder brother, we are acting as our own saviors. And none of us are up to the task. Regardless of which brother we identify as, a shared need is present. Our self-righteous piety or our self-seeking debauchery and destruction, or perhaps both, demand that a savior must come, to be our true elder brother. Someone who does not flinch in judgment at our gravest mistakes. Someone whose courage is great enough to embolden him to seek us out, cover our sins with his own blood, and take us home to our father, who is eagerly waiting for us to remember his love. Yet such an act never comes without a price. Keller writes, “Mercy and forgiveness must be free and unmerited to the wrongdoer,” even though it will be costly to the person doing the forgiving. The younger brother’s return home was at a significant cost to the elder brother, since the younger squandered his inheritance; the elder would have to lay down his rightful concern and admit him back on his own dime. Jesus’ sacrificial death, the greatest cost anyone could ever pay, and doubly great because Jesus was God’s only son, without flaw or wrongdoing, was the ultimate act of mercy and forgiveness. God proclaimed the price of sin is death. There was no other way around it. So not only did Jesus bear a cost for something He had no part in creating—the sins of humanity—but He did it knowing we, the ones who benefit from this act, are wholly undeserving of such selfless love, especially when you consider those who placed Him on the cross in the first place and those of us who still refuse to acknowledge His life today. It all comes down to this: we were each given a life God knew we would never deserve, and indeed, would abuse with our sin, but still He wanted us to have it. So someone had to pay. And He loved us enough to sacrifice a part of Himself, His beloved child and most perfect Son. With this in mind, who are any of us to deny someone forgiveness, or to hesitate at its cost to ourselves? The parable’s importance lies in this simple, yet devastatingly transcendent fact: forgiveness always bears a price and someone pays it. Jesus teaches us that we should never be so self-loving as to force that price on those deserving of it, but to think of Him, of His sacrifice, and bear the cost ourselves. Whatever we lose, we will ultimately gain, if not in this life, then in the next.